Here at SkyMall Tuesday headquarters, we're no strangers to products that help us heed the call of nature no matter where we find ourselves. Whether you're stuck on a long road trip, out for a hike, or spending the day on the water, bathrooms aren't always conveniently located. In the past, this forced people to wear adult diapers, relieve themselves in public, or soil their clothing. Those are hardly appropriate solutions to this all too common problem. If we can go anywhere, why can't toilets do the same? In these modern times, everything is made to be portable and used on the go. Well, we need something that is used when we need to go! Not surprisingly, SkyMall saw this problem and addressed it head on. Rather than frantically searching for a restroom or seeking out some large bushes, take (waste) matters into your own hands – or bags – with the Biffy Bag. 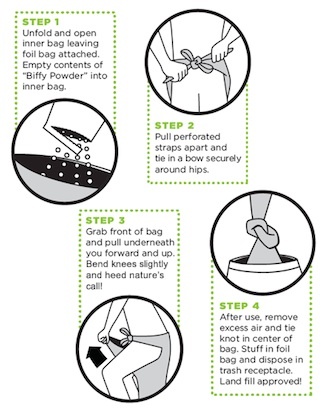 If you've ever opened up a plastic bag or tied knot, you can handle the Biffy Bag. If you've ever wondered what it would be like it if a diaper and a garbage bag had a baby, you can handle the Biffy Bag. It's that easy. It's that practical. It's "A Biffy in a Jiffy!" This handy disposable toilet is completely sanitary, and small enough to carry in your purse, pack or glove compartment. The three-layer leak and puncture proof bag ties comfortably around your waist, and the absorbent Biffy powder formula engulfs waste, solidifies liquids, and creates an immediate seal to neutralize odor 4000 times better than a regular garbage bag. So farewell to the days of pooping into a regular garbage bag! It's 2013, and the future in now! Still not sure how it works. Thankfully, they provide this handy guide. Just open, sprinkle, wrap, tie, pull, squat, relax, tie, and toss. It's that simple! What have we been doing with our lives (and our stool)?